West Point experience has significant impact on students | The Gettysburgian. It was snowing on Nov. 7 when a van carrying four students from Gettysburg College passed through the security check point at the front gate of the United States Military Academy at West Point. The four students represented Gettysburg College at the 64th Annual Student Conference on United States Affairs, or SCUSA. They had left campus at 7 a.m. Six hours later, they arrived at one of the nation’s historic service academies, embarking on an experience that would open their eyes to a new world. As an armed guard dressed in camouflage closely inspected their IDs that afternoon, each student realized that they were about to take part in something much more than a run-of-the-mill academic conference. SCUSA is a four-day immersion experience that allows civilian students from 100 colleges and universities around the country the opportunity to experience military life as the 4,000 West Point cadets live it on a daily basis. The conference was started shortly after World War II as an effort to bring civilians and soldiers together to discuss public policy, national security and current affairs. The trip was sponsored by the Eisenhower Institute. Students say the conference’s theme, “Leading in Lean Times,” was appropriate, given that it started the day after President Barack Obama was re-elected and days before politically-charged discussions about the so-called “fiscal cliff” began commanding headlines. In the midst of national discussions focused on budget cutting and tax and entitlement reform, the students at the conference were charged with assessing American priorities in an age of austerity. The conference brought together undergraduate students, West Point cadets, faculty members, professionals, military personnel and public servants who were assigned to roundtables covering a public policy topic of national interest. Topics ranged from the political implications of drone strikes to counterinsurgency to cyber security. Each group was led by two co-chairs with military or private-sector experience in the respective fields represented by each table. Each roundtable prepared a policy paper, but the conference was about much more than public policy. Sophomore Mike Arnone was assigned to the “Dollars and Sense of American Grand Strategy” roundtable. Even though he describes himself as a “policy wonk,” he said the most eye-opening part of the weekend was living in the barracks with the West Point cadets. Arnone is describing a West Point custom in which first-year cadets, commonly referred to as plebes, stand in the hallway of the barracks each morning and announce in a low monotone the day’s dress code, the menu for breakfast and the time remaining for cadets until morning formation, which is when the cadets in each barrack line up outside as a group. “Attention all cadets, there are 15 minutes until breakfast formation,” a cadet began slowly. Each SCUSA participant lived with two cadets who had volunteered to host a student throughout the weekend. It was a rare opportunity to gain an inside look at life in the barracks — so rare, in fact, that cadets’ parents are not even allowed to enter the halls when they drop their sons and daughters off at the start of each school year. Despite coming from a school on the site of one of the most significant military operations in their country’s history, this military lifestyle was a culture shock for many of the Gettysburg students at the conference. The cadets dressed each day in matching uniforms. Each walked at a rapid clip, with a purpose. The civilians slept on military cots in the middle of the cadets’ rooms. When the alarm sounded each morning at 6 a.m., the students watched as their hosts lined up for morning formation before breakfast. SCUSA participants also joined the cadets for meals in the mess hall, where all 4,000 cadets are fed family-style in less than 30 minutes, a strange feat for students who come from a campus where “Servo sitting” — spending many hours in the campus dining hall — isn’t out of the ordinary. Roundtable sessions occupied most of each day’s schedule, but students were treated to a variety of memorable speakers and events, including a tour of the historic campus, a weapons display led by the cadets and a panel discussion moderated by Congressional Medal of Honor Winner Jack Jacobs. President Richard Nixon presented Jacobs with the nation’s highest military honor for saving the lives of 14 men while under heavy fire during the Vietnam War. On Nov. 8, Susan Eisenhower delivered the conference’s keynote address in Eisenhower Hall. Eisenhower, who chairs the Eisenhower Institute’s leadership and public policy programs, spoke about leadership and the challenges facing the United States as it navigates these transformational times. “This is absolutely your moment,” Eisenhower told the hundreds of students and cadets in attendance. However, the most memorable experience for the Gettysburg Students at the conference was not even on the official itinerary. Early Friday afternoon, the Gettysburg students stood with Susan Eisenhower in front of the statue of her grandfather, President Dwight David Eisenhower, a West Point graduate. 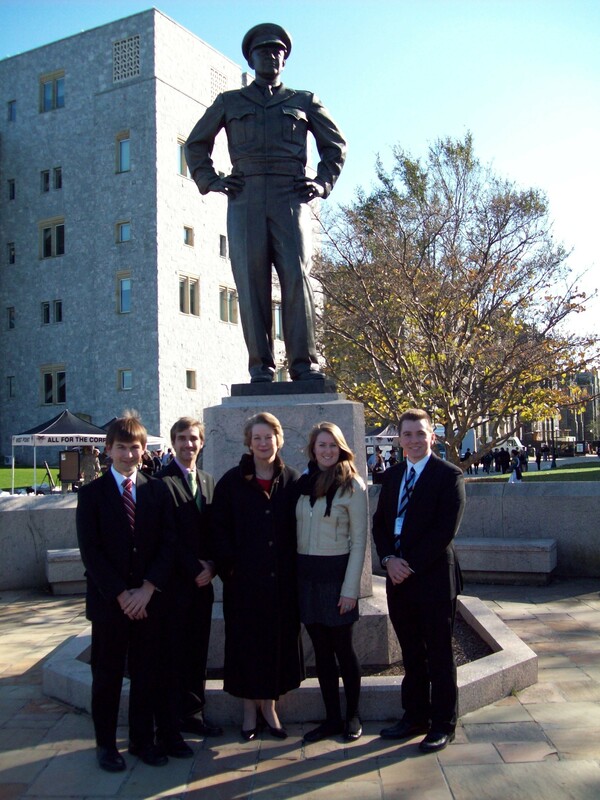 Ike’s Statue is a common sight for West Point cadets, but for the students speaking with the granddaughter of the Supreme Commander of the Allied Forces in Europe during World War II about her grandfather’s legacy, it was a moment they will never forget. Many students and speakers addressed the conference’s importance in bridging the growing civilian-military divide in the United States since the drafts during World War II and Vietnam. The divide is noticeable: Only one percent of the 240 million Americans over 18 have served in Iraq or Afghanistan. If bridging this growing divide was the goal of SCUSA 64, Arnone believes they succeeded. National service was the underlying theme of the weekend. For many of the students in attendance, public service was something to be pursued after college, if at all. But when they woke up each day on a military cot to the sound of a plebe announcing what was for breakfast, they realized that for many brave men and women our age, national service starts every morning at 6 a.m.
Anthony, what a fabulous experience for you! Great article! Congratulations again on your acceptance to Georgetown! You make us so proud of you everyday! !